With Tech N9ne’s “Hostile Takeover 2012” Tour fast approaching, the buzz around live Strange Music experiences has been felt all over the web. Looking forward to hitting the road with Tech N9ne and Machine Gun Kelly, Strange Music’s Prozak has been joining in the conversation as he prepares to shatter records on the longest tour in rap history. From outrageous moshpits to high energy performances, Prozak’s live shows are just a piece of the mayhem that fans can expect this summer on the “Hostile Takeover 2012” Tour. Going straight to the people who know best, Prozak recently asked fans on Facebook and Twitter to share their favorite memories from Strange Music shows over the years. Whether it was meeting their favorite artist or moshing to songs like “Riot Maker” and “Bombs Away”, fans old and new recalled their very best experiences with Strange Music. 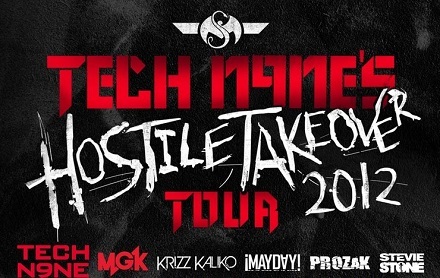 Don’t miss out on creating brand new memories with Tech N9ne’s historic “Hostile Takeover 2012” Tour! What’s your favorite memory from a Strange Music show?